We are hot water specialists. We can supply and install new hot water heaters as well as service and repair with your existing one. As well as all commercial hot water unit and boilers we work on domestic heaters too. For our commercial customers we can access your needs and install gas boilers and storage units to cope with high demand when cleaning or for your manufacturing process. 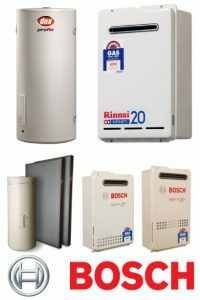 For our domestic customers the main hot water heaters we deal with on a daily basis are the electric and gas units. Within each of these types of heaters they can be divided further into the tank and instantaneous styles. Gas hot water heaters have earned themselves a reputation as being the most economical types of hot water heaters to run. Within gas water heaters we can divide them into gas storage tanks and gas instantaneous. The storage tanks come in indoor and outdoor variants. The indoor versions require a flue to take the burnt gas by products out of any enclosed spaces. The gas storage tanks provide a competitively priced method of providing hot water while still being economical to run. All of the major brands provide a great selection of indoor and outdoor tanks in various sizes. These brands will offer quick recovery variants of their heaters too. Gas instantaneous heater have become very popular in the last twenty years. Today the Rinnai Infinity range is enjoying a large market share, which Rheem are keen to get involved in with their Continuous flow series. Rheem have taken the fight right up to Rinnai with their 6 and new 7 star rated models. The benefits of instantaneous hot water systems are many; they never run out of hot water, they are small and take minimal space, they tend to last longer than a tank, they don’t have relief valves so there is a reduced maintenance expense and they are extremely energy efficient. We deal in all brands of hot water units. We are your one stop shop for everything hot water!